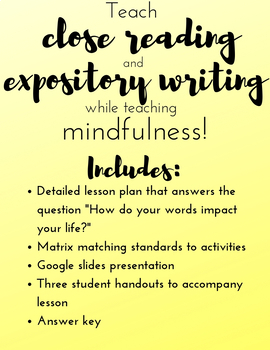 This complete lesson guides students through a series of close reading activities that guide them to answer the essential question, "how do your words impact your life?" This lesson was designed for middle to high school aged students, and could be structured to fit a 50 minute class period with homework, a block period, or two 50 minute class periods, depending on your preference. What useful skills do students practice? Students begin to explore the essential question through inquiry by first close reading a paragraph describing Khyra's (a fictitious student) day. Each student gets a paragraph, but two different paragraphs get passed out. While both paragraphs describe the same day, one is written in from a positive frame of mind, and one is written from a negative frame of mind. The students don't know this, though! As they read, students annotate the paragraph for positive and negative language, create a graph of the person's emotions, and summarize their findings about Khyra's feelings about her day. Once this is done, students who wrote that Khyra had a good day are asked to stand up, and partner up with someone who did not stand. Students discover through inquiry that the paragraphs are about the same day, and the only thing that changed their opinion about whether or not Khyra had a "good" day were the words Khyra used to describe her day. Students then watch a TED talk and complete guided questions to illustrate the scientific research that supports just how much the words we speak matter. Finally, students write an expository paragraph in which they compare how a famous quote and the information provided in the TED talk support the same answer to the essential question. If you have more questions not answered here, please reach out and ask! consciousclassroomresources@gmail.com or shoot me a question through TpT!